The Micro Four Thirds standard appeared to be in less than rude health last year, with Panasonic jumping to full-frame and Olympus not releasing a new product. The format's fortunes have had a shot in the arm this year, however, with Sharp officially joining the Micro Four Thirds System Standard Group. The NAB Show is taking place in Las Vegas this weekend, where it is expected that the Micro Four Thirds-powered Sharp 8K Video Camera will see its official reveal. In anticipation, Olympus announced that Sharp has become an official partner in the future of the format. "Olympus Corporation and Panasonic Corporation jointly announced the Micro Four Thirds System standard in 2008 and have since been working together to promote the standard," says the Olympus statement. "We are pleased to announce that Sharp Corporation has recently declared their support for the Micro Four Thirds System standard and will be introducing products compliant with the standard." While making no direct reference to the Sharp 8K Video Camera, the statement was sure to state the company's expertise in that specific area (make sure to check out our guide if you're wondering what is 8K and why is it the next big thing). "As the driving force behind 8K imaging technology and a product developer, Sharp Corporation now supports the Micro Four Thirds standard. In the future, Sharp will add Micro Four Thirds products to their line-up. The possibilities unique to a joint standard will expand the enjoyment of imaging further." First shown as a "reference exhibit" at CES in January (which, as it happens, was also in Las Vegas), the Sharp 8K Video Camera was the first sub-$5,000 8K prosumer camera to be debuted and looks to be an exciting prospect for videographers. 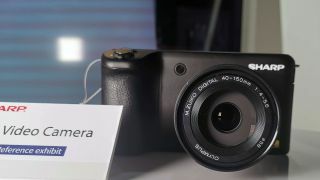 Much like the Blackmagic Pocket Cinema Camera 4K, it's an extremely compact device (thanks to its MFT innards) featuring image stabilization, 30fps shooting (with a target of 60fps) using the H.265 codec, and a huge 5-inch articulated touchscreen. We're looking forward to seeing the full specs (and a proper name) for the camera, as well as seeing what other products Sharp has in store for Micro Four Thirds.